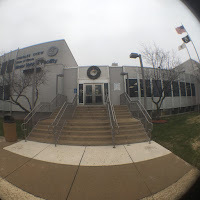 Recently I went to the Charles Chew Secretary of State facility for a driver's license renewal. Now in the past I have not only gone to this particular facility also have used the ones in downtown Chicago over the years. Thankfully I haven't had to take a road test or written test since getting my license. A few years ago all I had to do to renew my license was online or via mail since we have safe driver renewal. No tests of any kind pay the applicable fee and then wait a bit of time before getting another copy of your license. Years ago, I would've only gotten a sticker to be placed on the back of the license. It seems every time one renews a license there's a new design or some new procedures. When I went up on this occasion I went through the back doors in the middle of the facility, it turns out this was the wrong way. It wasn't always the wrong way, once upon a time going through the middle doors and to the left was where you started the process of getting your license. These days the process ends where I enter the facility. They directed me to that area after telling me I came in the wrong way since there was another door outside that I should've entered. Having to go through the cashier area trying to figure out my next stop was further confused and just asked the cashier about license renewal he directed me to the right place. I also did recognize that I was actually cutting a line and people were wondering why they weren't next! No more confusion at this point. Wait in a long line, go up to a Secretary of State worker show an ID or some identification - social security, birth certificate, etc. - given a number and then take a seat and wait again! To be honest this wasn't entirely painful yeah there was some waiting, but not a lot of waiting. It wasn't a particular long time in a somewhat lengthy line, and it wasn't a long wait until it was time to go back up to a counter. To go up to a counter basically the worker is just going to go over vital personal info in addition to information as far as any legal issues, medical or mental issues. They ask about organ donation or if you're a registered voter. Once they got all the info they need they have you sign an application they printed for you. After that you take a vision test once you pass it you're basically good they'll let you know of any restrictions. They send you to cashier to pay the applicable fee for the license. After leaving the cashier I was right back to where I started and no more confusion from me. The cashiers directed me to the counter to the right and no line so I could just walk up to the front of the line. It wasn't a long wait for me to get called up and another worker takes the application punch a whole in my soon to expire license and directs me to yet another adjacent area and wait for my name to be called. Here I get my photo taken and they will hand me a temporary copy of my driver's license. Now they don't just give you a license the same day it has to be sent to you from somewhere within 15 days. It was packed when I had to sit in this area, though eventually it thinned out and after a brief wait my name was called got a new photo taken. Then within a short time got my temp license printed and ready to go. It took about an hour, but thankfully mission accomplished. Got my driver's license renewed and it didn't take hours - not that it ever did - it took about one hour. Time to go home first I needed to take a photo of the facility on my phone with my olloclip lens.